Mr. Monkey said he had an anniversary surprise for me that required ample time to enjoy, so I made an early reservation at Osteria Mozza to accommodate his surprise. 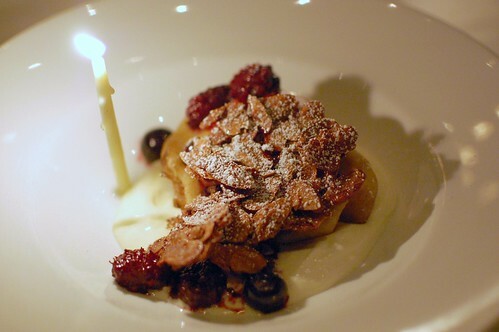 Osteria Mozza may have a Michelin star, but it's the opposite of stuffy and staid. Lots of patrons arrive in jeans, albeit Hollywood-approved jeans. This is the corner of Melrose and Highland after all. Mr. Monkey looked comfortable in one of his many Ben Sherman shirts. He lives in those things. I think he thinks it's his upscale casual dining uniform. 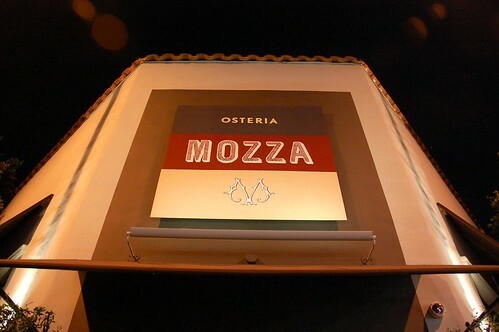 The brainchild of Nancy Silverton, Mario Batali, and Joseph Bastianich, Osteria Mozza serves sophisticated yet comforting Italian food in a loud and bustling environment. This is not the place to woo a potential lover. This is the place to woohoo! with your already lover. And that's what we did. 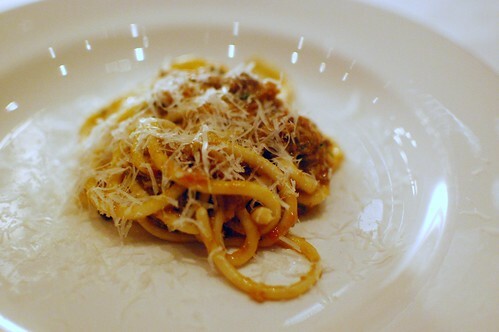 We saw the Pasta Tasting Menu ($69), and it was decided. Great beginning with the amuse bouche. 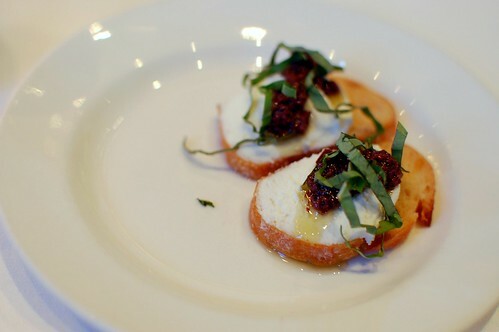 Nice little taste of the restaurant's specialty -- mozzarella! 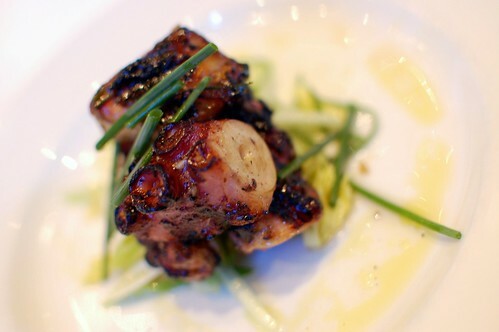 Before we began our fancy carbo-loading, we inhaled the grilled octopus with potatoes, celery, and lemon ($18). As we ate this, there was a whole lotta "Ohmygod-ing" and "mmm-ing" and "ooh-ing." You must get this. Must. So beautifully charred and meaty and balanced with a light tartness. Dare I say it? Woohoo! Don't worry. As much as everything deserved it, I will stop with the Woohoo! now. Ok, a couple more. Woohoo! Woohoo! Seriously, guys. This octopus was incredible. On to the precious pasta! Farfalle with noci and morels. What a delight! Emphasis on the light! 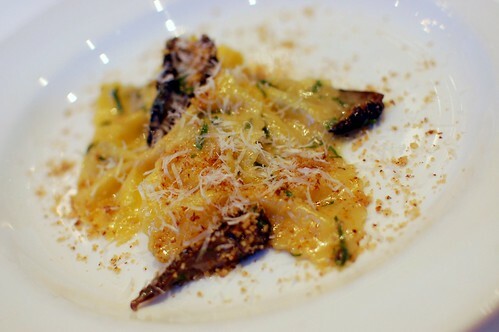 The farfalle was so delicate and lovely, and the mushrooms (I ate both mine and Mr. Monkey's) were amazingly flavorful. That's saying a lot, coming from a girl who, for her wedding, proclaimed, "There shall be no fungus among us!" 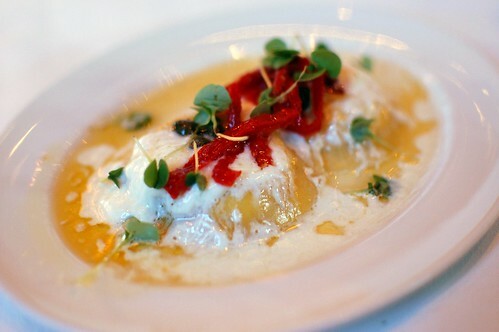 Ravioli di burrata with caperi e pomodorini. I can't even begin to tell you how lip-smackingly good this was. It may have been the best cheese ravioli I've ever had. The burrata just went on and on and on. And so did I about the dish throughout the night. Mr. Monkey declared, "It's so rich!" Deliriously happy. 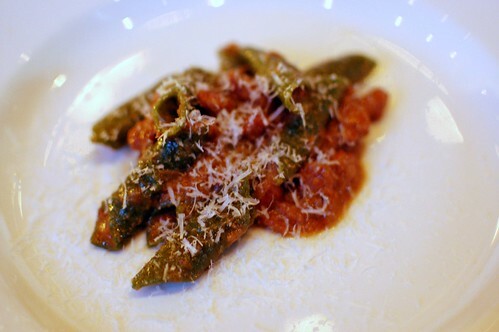 Garganelli verde with ragu Bolognese. Pretty yummy, but not so yummy to warrant incoherent raving. Francobolli di brasato with passato di pomodoro. So. Stuffed. With. Meat. Like fully. And not just any meat. A scrumptious smoky beef filling that totally took over the thin postage-stamp-like pasta. Fabulous. Monkey want a quacker! 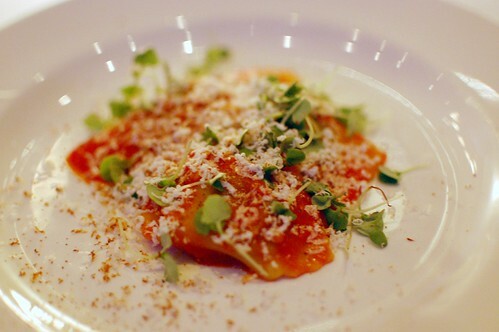 It's hard to say whether the duck pici or the burrata ravioli was my fave of the night. The pici was a tasty chewy thicker cousin of spaghetti. The duck was tender and damn near ambrosial. Even better, there was plenty of it. Mr. Monkey remarked, "They gave us a lot of duck!" Yes, they did. Thank you. Thank you. 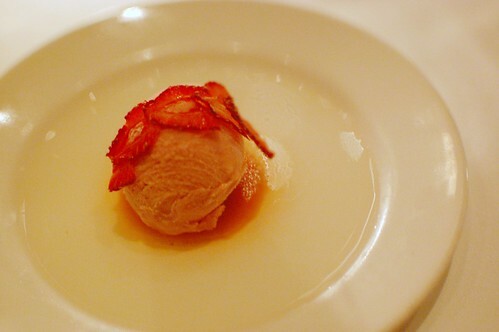 Gelatina di fragola e prosecco. Palate cleanser or light dessert? Either way, very enjoyable. Can you see the thin layer of gelatin on the plate? I didn't until I actually dug in! And it was made with prosecco! Crespelle di frutti di bosco and gelato di fragola. Our server wished us a happy anniversary, and we each got a candle on our final dish. Aww, how cute. An Italian crepe with cream and custard and gelato and fruit and candied nuts? Was there even a possibility that we wouldn't like this? The many textures and different types of sweetness were just a joy to eat. Superb ending to a superb meal. 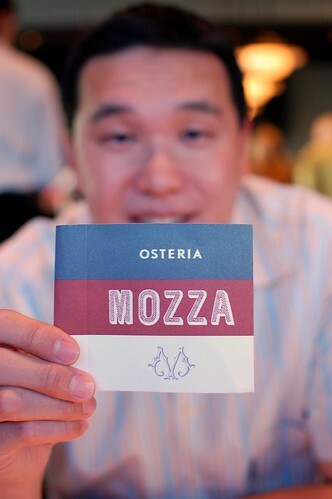 Needless to say, we had a marvelous time at Osteria Mozza. 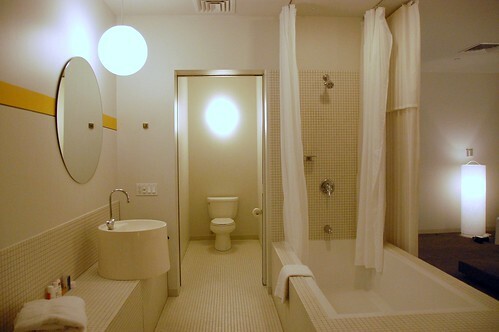 Here's the surprise -- a Huge Room (yes, that's what it's called) at The Standard Hotel downtown. Usual price? $325. Mr. Monkey's price? $99. The travel ninja strikes again! Happy anniversary indeed! I love that you appreciate octopus -- I am an absolute zealot! I don't know when in the history of humanity someone took a look at an octopus and thought, "I want to eat that," but I'm really glad he/she did. That food looks amazing. Especially the amuse bouche, total perfection. And can Mr. Monkey please become my travel agent? Totally serious, I'll pay him commission and everything. The man is a deal-finding master! I'm glad that sticker is on the toilet paper in case you weren't sure what to do with it. Happy anniversary!! 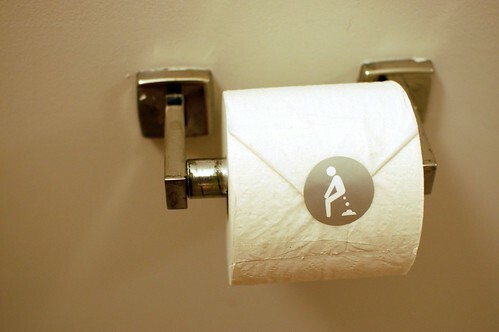 Love the TP sticker! Love that you guys always party in style! Happy anniversary!! ok, first of all woo hoo! hootie hoo! woot woot! wu tang clan! (sorry ran out of ideas). second of all, why is your husband the priceline negotiator? i'm consulting you for travel deals. Awww, happy belated anniversary! What a wonderful way to celebrate! 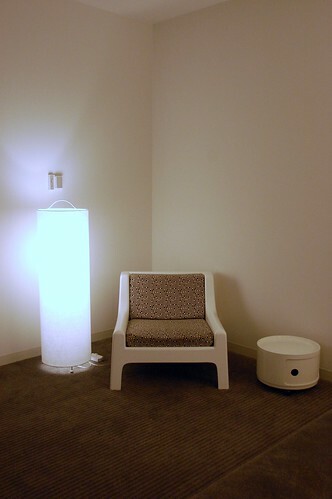 That room is AWESOME! I about died when I saw that sticker. Mr. Monkey is a ninja. If I could star this blog post I'd give it 5 stars.. I cackled at Monkey want a quaker! 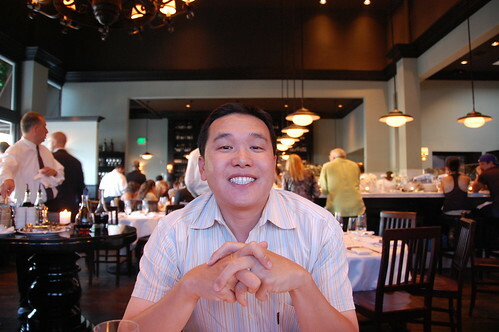 ok, now we really have to do osteria mozza sometime soon. forget the pizzeria. octopus, burrata, and carbs are my best friend. I recently went to B&B Ristorante in Vegas and wanted so badly to eat the pasta tasting menu, but couldn't stomach the redic price. $69 is so much more reasonable, and your post has convinced me that I MUST go here. STAT. My compliments to the Travel Ninja. He's a keeper! I loveth the Mozza. Maybe I will marry it so I can celebrate all my anniversaries there? Another great meal! 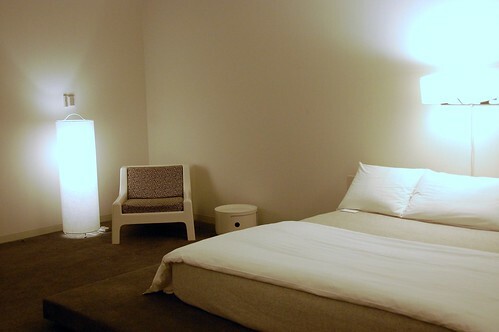 That hotel room looks so modern. Somehow that's what I picture when I think of your digs. yay for your anniversary! and um that place looks amazing and the food delicious as always. i love the sticker on the toilet paper too, haha too funny. That ravioli looks amazing. Mmmm. And I love the downtown Standard. How fun. Yay for you and your Ninja! the food looked amazing! i can *almost* taste the stuff given your descriptions. what a way to celebrate your anniversary! Everything looks awesome! Happy anniversary to the Monkeys! what an awesome looking meal! 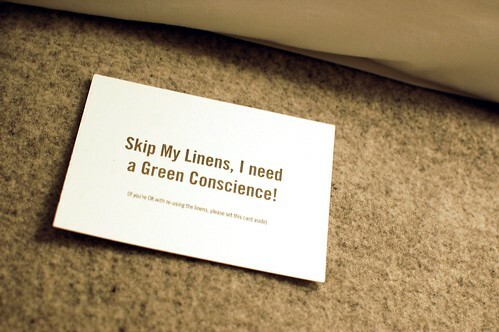 and reasonably priced, too! mr. monkey needs to pimp out his services. The pasta tasting menu sounds delicious. 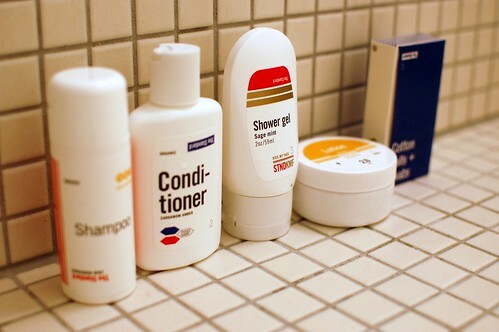 love the toilet paper sticker, I always get confused in hotels what TP's purpose is. that travel ninja is the best. Yummmm the food looks deeelicious. I must convince my husband to take me there. I love how I'm a week late on this congrats. So sorry lah! Your man's the Priceline KING. Amazing. We also went to Mozza for a celebratory meal (ramping up for a wedding demands celebrations? Iunno). Cept I never seem to eat anything good when the sun's out, so your pix are just AWESOME compared to crap I got. We still haven't been, but I'm drooling all over the pictures. 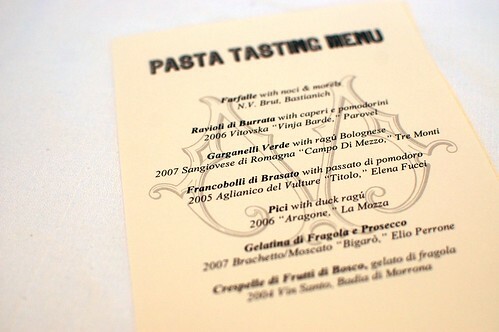 I love the idea of a pasta tasting menu - so fun! Happy belated anniversary! a PASTA tasting menu. mmmm. the room is awesome! nice job, mr. monkey.